Lift & Carrier experts are standing by. We carry a large selection of internal lifts and external carriers and trailers for transporting your mobility scooter or power wheelchair with your vehicle. We have manually operated models and models that fit on cars, minivans, or SUVs. Our power chair lifts and carriers and mobility scooter lifts and carriers are compatible with all mobility vehicle manufacturers. For additional information on picking the right lift or carrier for your automobile, click here to view our Buyers' Guide for Vehicle Lifts and Carriers. External mobility carriers are designed to carry your manual wheelchair, power wheelchair, or mobility scooter on the outside of your vehicle. They attach to the vehicle's hitch in the rear. The amount of weight you can place on external mobility carrier depends on the vehicle's hitch rating. A cover is highly recommended when you use your wheelchair or scooter with an external mobility carrier. External mobility carriers from all manufacturers are listed here. 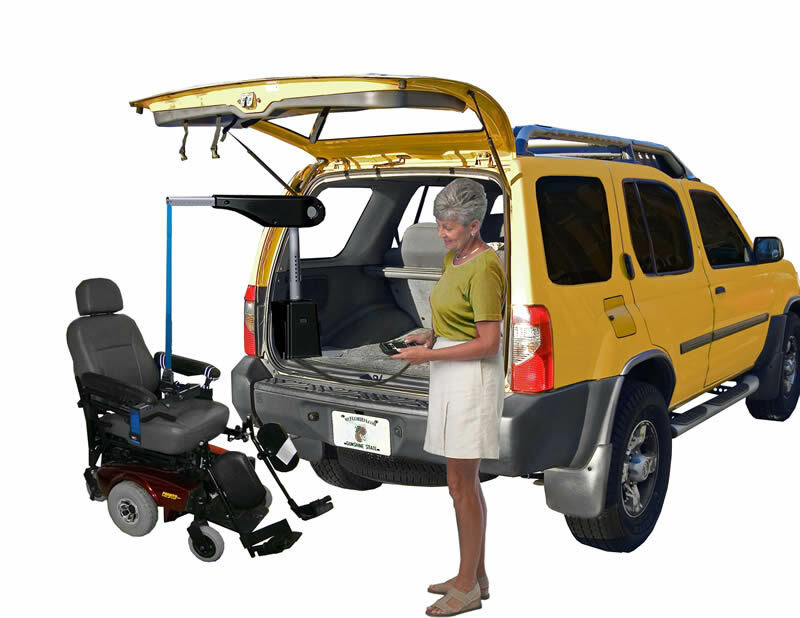 Internal mobility lifts are designed to lift your manual wheelchair, power wheelchair, or mobility scooter into your vehicle for transport. Lifts for trunks, rear storage areas, and truck beds are available. Most internal mobility lifts operate like a crane, but higher end ones have platforms that extend to the ground outside your vehicle allowing you to simply drive onto the platform and load at the touch of a button. Internal mobility lifts from all manufacturers are listed here. These lifts and carriers are compatible with power wheelchairs. External mobility carriers and internal mobility lifts from all manufacturers are listed here. These lifts and carriers are compatible with mobility scooters. External mobility carriers and internal mobility lifts from all manufacturers are listed here. Hand-operated lifts and carriers do not require any connection to your vehicle's battery greatly simplifying installation, just attach them to your vehicle's hitch. These lifts use ramps that make sure loading your power wheelchair or mobility scooter is virtually effortless. Hand-operated lifts & carriers from all manufacturers are listed here. Trailers attach to your vehicle's hitch and represent an extremely simple solution to the problem of transporting your power wheelchair or mobility scooter. However, trailers are much larger than external mobility carriers and can make driving more difficult. If you own an electric scooter, power wheelchair or manual wheelchair and are considering using a vehicle mounted carrier, there are several things you need to consider. First of all there are two basic options; manual vehicle mounted carriers, and electric vehicle mounted carriers. View all of our scooter and wheelchair carriers. Weather. Electric wheelchairs and electric scooters have electronics that make them sensitive to the elements, primarily rain and snow. If you live in an area where extreme weather conditions are common, you should limit your options to inside carriers or trailers. In mild weather conditions, covers are available that can provide limited protection for your scooter or wheelchair. They do not provide protection from water, snow or de-icing agents splashing under the lift and onto your scooter or power chair. Vehicle. The two biggest factors in choosing an electric scooter or power chair carrier is the type and size of your vehicle and its hitch rating. Automobiles have different capacities for towing. SUVs and trucks obviously have greater capacity for hauling than light cars do. It is important to have a suspension system that is capable of carrying the total weight of the package you intend to transport. Suspension systems can be bolstered. This will insure your wheelchair carrier doesn't bottom out when you enter driveways or hit bumps in the road. The tongue weight capacity of your vehicle is related to the type of hitch for which your vehicle is rated. Hitch ratings are Class I, Class II or Class III. Each class has a maximum tongue weight capacity and has a different size tongue sleeve. In order to determine the hitch rating for your vehicle you should speak with an authorized representative. For every hitch, the manufacturer stipulates the minimum hitch class required for its lift. Therefore the hitch capacity of your vehicle determines what choices you have available when selecting a wheelchair carrier or electric scooter carrier. While it is possible to use a carrier that requires a Class I rating with a Class II or Class III hitch, the reverse is not true. In this case, sleeve adapters are available to change the size of the sleeve on your hitch to fit the size of the carrier. This link can provide you information regarding your vehicle, its hitch rating and the lifts available. Budget. Obviously, your budget will determine the choices you have. Manual lifts are the least expensive. Inside and outside electric lifts are the most expensive. They also provide the most convenience and protection for your electric wheelchair or electric scooter. Manual carriers are typically less expensive and are easier to install than most other types of carriers. They are typically hitch mounted, meaning they have a tongue that slides into a trailer hitch. Manual carriers take more physical strength to operate because they are gravity driven. They most often utilize a tilt mechanism that requires your scooter or wheelchair be pushed up and into a position that will allow the tilt mechanism to bring your scooter or wheelchair off the ground and up and level with the height of your trailer hitch. Manual electric scooter and wheelchair lifts are an excellent option for a person who is physically able to use them. Manual wheelchair carriers are also available for manual wheelchairs. They can provide a better alternative than trunks and the backseats of your vehicle. Inside wheelchair carriers come in two basic types: hoist and carrier. Hoists have armatures that act like cranes. The hoist is mounted onto the floor of the vehicles trunk, truck bed, back of SUV or slides into the vehicles hitch mount. The power wheelchair or electric scooter is hoisted from ground level up and into the trunk, truck bed or SUV. These types of electric scooter carriers need to be ordered with a special attachment that hooks onto or under the seat of the electric scooter or power wheelchair. The size of your electric scooter or electric wheelchair will determine whether or not this option will work for you. Also important is the height of the seat and whether or not it can be folded down or removed before stowage. Inside carriers come in a variety of types with many manufacturers providing different alternatives. Insert link. Like hoists, electric scooter carriers can be mounted in the vehicle or into the sleeve of a hitch. As mentioned above, the hitch rating is important in determining the type and size of carrier you can choose. Outside electric scooter carriers are easier to use and are available from a plethora of manufacturers. Because they are mounted outside the vehicle, the size and weight of your scooter or wheelchair and the size and height of the seat are less consequential. Outside electric scooter and power wheelchair carriers are usually mounted via a hitch. Once again, the main consideration is the hitch rating of your vehicle, the tongue capacity of your hitch and the load capacity of your vehicle. In summary, the choices you make regarding the electric scooter or electric wheelchair carrier that is right for you are effected by many factors. Good advice from one of our knowledgeable representatives can save you time and money, so please don't hesitate to contact our vehicle lift experts by dialing 1 (800) 736-0151.